A FOOTBALL club in Sonning Common wants to build a new clubhouse as part of a six-year expansion plan. Rotherfield United Football Club, which is based at Bishopswood recreation ground, off Gallowstree Road, is fund-raising for the project and wants to complete it by 2023, when the club will be 50 years old. It wants to have more teams, set up an academy and involve the club more in the community with an emphasis on health and fitness. The club currently runs two men’s sides and children’s teams from under-fives to under-17s. Chairman Andy Tidswell, from Peppard, said: “We want to be the best community football club in Oxfordshire and Berkshire, providing an opportunity for all to play football and develop a healthy lifestyle. l Maintain high-quality grass pitches and build a clubhouse which would be a focal point for numerous sports and leisure activities. l Build on the success of the youth teams and form more women’s and girls’ sides. l Establish an academy to help teenage boys with the transition from junior to adult football. The club has received a grant from the Football Foundation, a charity which funds grassroots football, to help it set up the academy. Pitch renewal work has been supported by Henley Tesco’s “bags of help” initiative, Sonning Common Vauxhall, the Chiltern Edge Community Association, Peppard Building Supplies and the Oxfordshire Football Association. Mr Tidswell said the new clubhouse would have modern changing rooms, toilets, a café/bar and a function space and would provide room for other sports activities. 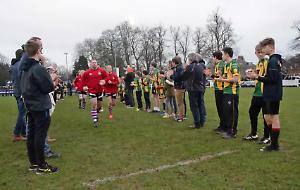 He said: “Our parents are terrific and have raised more than £5,000 towards the clubhouse and we have started a crowdfunding campaign to build on this. Grant applications are in preparation to provide the remainder of the funding. “The clubhouse will be a hub for the club and the other groups which use our facilities, such as Sonning Common & District Tennis Club. “From our beginnings in 1973, the club has grown to be a major part of the community and many people in the area have come through the club. “The club is open to all and has become FA chartered standard. We have grown the number of teams and also created girls’ teams, another men’s team and a walking football team. “Our pitches form a vital open space for members of the community to take part in sports and leisure activities, which promotes health and fitness in the community.